The major goal of this study is to investigate the irregular nature of the LC system and to evaluate the robustness of its statistical characteristics derived from altimetry. The study is conducted in the framework of a regional HYbrid Coordinate Ocean Model (HYCOM) [Halliwell et al., 1998; Bleck, 2002; Chassignet et al., 2003] configured for the Gulf of Mexico. HYCOM (www.hycom.org) is the ocean component of the Navy global assimilative, real-time nowcast/forecast system [Chassignet et al., 2009]. Using this configuration, a free running multidecadal (54 years) simulation of HYCOM is performed to analyze mesoscale circulation in the Gulf of Mexico and to characterize the interannual variability of the LC. 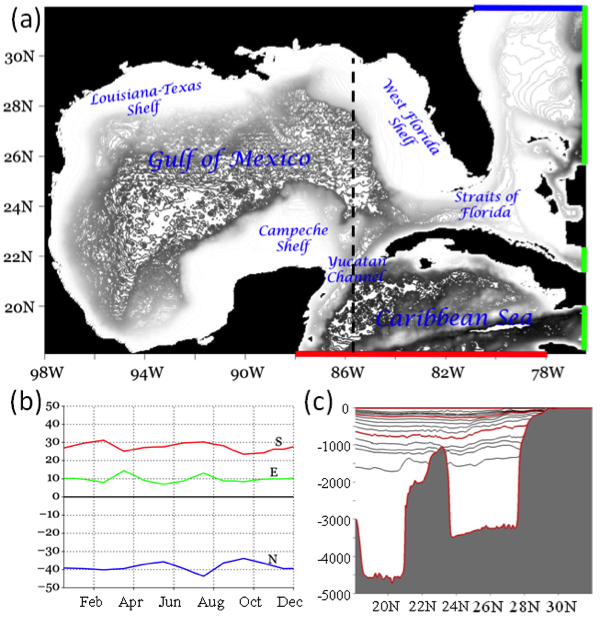 This multidecadal simulation of the Gulf of Mexico is longer than available observations and any other model simulations of the Gulf. The 1/25° regional HYCOM of the Gulf of Mexico (GOMl0.04) is configured in the domain from 18.9°N to 31.96°N and from 98°W to 76.4°W (Fig. 1a). The vertical grid uses 20 hybrid layers. The target densities for the vertical layers are chosen such that the layers are compressed in the upper ocean at the expense of vertical resolution at depth (Fig. 1c). In the current configuration, the K-Profile Parameterization (KPP) [Large et al., 1994; 1997] turbulence closure scheme is employed. Model bathymetry is derived from the Naval Research Laboratory Digital Bathymetry Data Base 2-minute resolution (NRL DBDB2; www.7320.nrlssc.navy-mil/DBDB2_WWW). Monthly climatology of river runoff is specified at 40 locations along the coast. More details of the model parameters are listed in Table 1 (see also the model description at hycom.org/dataserver/goml0pt04). In the current study, a model nesting approach similar to that of Zamudio and Hogan  is used. The 1/12° Atlantic HYCOM, used as the outer model, covers the domain from 27.9°S to 70°N and from 98°W to 36.2°E. The GOMl0.04 has open boundary (OB) conditions derived from a bi-weekly climatology produced by four years (2000–2003] of a free running simulation of the 1/12° Atlantic HYCOM. Figure 1b shows volume fluxes across the open boundaries of the inner model GOMl0.04 that are derived from the 1/12° Atlantic HYCOM. This volume transport yields a mean Yucatan transport of about 29 Sv. Relaxation time at the boundaries varies from a 0.1- to 10-day e-folding time over a 20-grid relaxation zone. At the surface, GOMl0.04 is driven by fields of 10-m wind speed, vector wind stress, 2-m air temperature, 2-m atmospheric humidity, surface shortwave and longwave heat fluxes, and precipitation. Surface latent and sensible heat fluxes, along with evaporation, are calculated using bulk formula during model run time. The bulk transfer coefficients are parameterized following Kara et al.’s  algorithm. Atmospheric forcing is derived from hourly fields of the Climate Forecast System Reanalysis (CFSR) [Saha et al., 2010] from 1992 through 2009. This 18-year record of surface forcing is repeated three times (three cycles), producing a continuous 54-year model integration. The ends of the surface forcing time series are blended to prevent shocks in forcing between cycles. The surface forcing is used in this way to mimic the stochastic nature of atmospheric forcing in the real world. Since the model run is not data assimilative, position and configuration of the Loop Current and LCEs in the simulation are not expected to match those in the real ocean at any given date. Thus, the actual dates are meaningless and will be used throughout the text for reference purposes only. The simulation is initialized from a spin-up simulation that begins from rest with the Generalized Digital Environmental Model 3.0 (GDEM) climatological fields. During the first year of the spin-up run, the model is forced with three-hourly atmospheric fields from the Fleet Numerical Meteorology and Oceanography Center’s Navy Operational Global Atmospheric Prediction System (NOGAPS) [Rosmond et al., 2002]. At the open boundaries, GOML0.04 is relaxed to the GDEM climatology. Then the model is run from 2005 through 2009, being forced at the open boundaries by nesting fields derived from the 1/12° Atlantic HYCOM and NOGAPS fields. The model state following this spin-up process is then used for initializing the CFSR-forced 54-year simulation. Figure 1. (a) The Gulf of Mexico HYCOM model domain (GOMl0.04). Input from the 1/12° Atlantic HYCOM is imposed at the open boundaries shown with colored lines. (b) Volume fluxes (Sv) along the GOMl0.04 open boundaries calculated from the nesting climatology velocity fields derived from the 1/12° Atlantic HYCOM during a year. Positive flux is into the model domain. Vertically integrated fluxes are presented for three open boundaries (red) Southern, (green) Eastern, and (blue) Northern. The abscissa is time (months). (c) Hybrid vertical layers in the meridional cross-section along the dashed line in (a) for one particular time (note that layer depths change with time). Red contours are every 5th layer. The ordinate is depth and the abscissa is latitude.